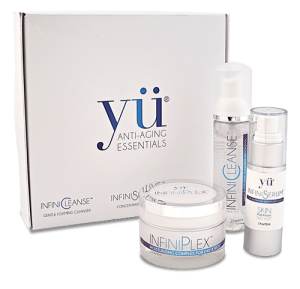 JuvDefense Plus is an ultimate antioxidant and mitochondrial support formula for longevity. JuvDefense Plus by AgeImmune is a scientifically developed combination of broad-spectrum antioxidants and mitochondrial support cofactors. It promotes healthy aging through maintaining youthful gene expression, mitochondrial function, cellular energy production and antioxidant protection. 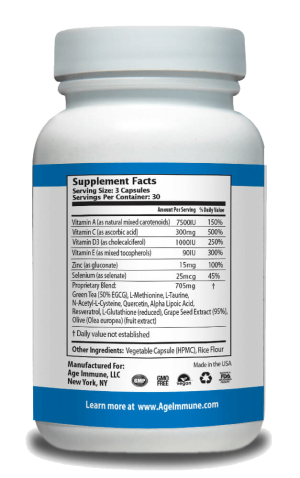 JuvDefense Plus – combination of broad-spectrum antioxidants and mitochondrial support cofactors. It promotes healthy aging through maintaining youthful gene expression, mitochondrial function, cellular energy production and antioxidant protection. We all know that we need oxygen to live. Many of our body functions require oxygen environment. Oxygen is vital molecule and one of its many properties is to oxidize carbohydrates and fats. During chemical processes, oxygen is stripped of hydrogen and then becomes very unstable chemically charged molecule – reactive oxygen species. Reactive oxygen species is also known as a type of “free radical”. Many chronic conditions have been linked to damage caused by free radicals. In addition to free radicals, our bodies are also exposed to numerous toxins. Together with toxins, oxidative stress (imbalance of radical-generating and radical eliminating mechanisms) may initiate reactions that damage cell components, including DNA, mitochondria. In recent years, Standard American Diet became deficient in intake of fruit and vegetables, resulting in diminished intake of antioxidants, phytochemicals and essential fatty acids. The deficiency of antioxidants may promote systemic inflammation and damage to intracellular structures, which control every chemical process in the body. 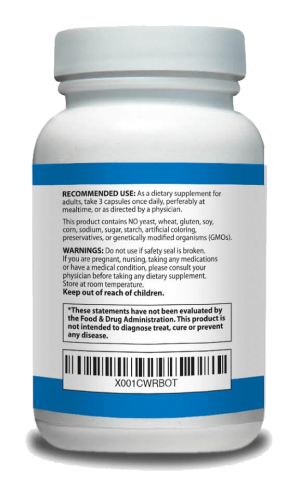 Supplement Facts Serving size: 3 Capsules Servings per container: 30 Vitamin A 7500IU Vitamin C 300mg Vitamin D3 1000IU Vitamin E 90IU Zinc 15 mg Selenium 25mcg Proprietary Blend (750mg): Green Tea (50% EGCG), L-Methionine, L-Taurine, N-Acetyl-L-Cysteine, Quercetin, Alpha Lipoic Acid, Resveratrol, L-Glutathione (reduced), Grape Seed Extract (95%), Olive Fruit Extract (Olea europea) Recommendations: As a dietary supplement, take 3 capsules daily, with meals.